Just Romantic Suspense: Truth or Consequences and Giveaway! 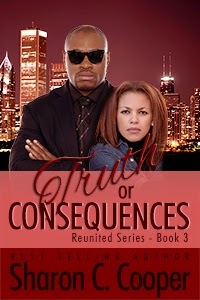 Truth or Consequences and Giveaway! Congratulations to "Brooke B." the winner in Sharon's giveaway. Thank you to all who participated. One of my all-time favorite songs from back in the late 70’s is Reunited, by the R and B singing duo, Peaches and Herb. Even at a young age the love song touched me, making me believe in happily-ever-afters and second chances. With that said, when I first started reading romance novels, it didn’t come as a surprise to me that I gravitated to the ones that had a reunited theme or where a couple in love was given a second chance. It’s also the reason why my first book series is entitled: the Reunited Series. Below you’ll find the description and an excerpt from my latest release, Truth or Consequences from my Reunited Series. A sliver of moonlight shone through the slats of the blinds, guiding her to the massive bed in the middle of the room. NOTE: Have you read Secret Rendezvous, the *FREE* short story that introduces some of the characters in the Reunited Series? If not, check it out! It’s *FREE* at all ebook online retailers. Here’s the link to the *FREE* copy on Amazon.com. 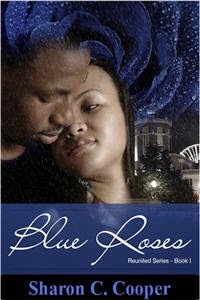 Prizes – An ecopy of Blue Roses from the Reunited Series and a $5 Amazon gift card (1 winner). How to Enter: Leave a comment answering the following question – What are your favorite themes in a romantic suspense novel? I love the wrong place, wrong time theme in the romantic suspense especially when the heroine stumble into something she was supposed to see or be. Me too, Kai! Thanks for stopping by! I have lots of favorites, let's see....I love second chances...I love when he saves her (or she saves him)...I love serendipity...I love friends becoming more...I love when he's in a position of power (fbi, law enforcement, military etc.) and he has to protect her. Lol, Brooke, your list of favorites look like mine! I too like a variety of themes. Thanks for stopping by! Is do or die a theme? I love the thrill and chase. Mary, if do or die isn't a theme - it should be! :) Thanks for stopping by! Redemption theme is interesting. And, congratulations on your series, Sharon. Great where you got the title too. Thank you Janet!! And thanks for stopping by!